Elevate Ambassadors will develop an idea for a project to improve survivorship care in their community, whether at a hospital, oncology practice, community-based organization, or virtual community. NCCS will provide training, support, and a virtual learning collaborative to help Elevate Ambassadors develop and execute a plan of action. Learn more about Elevate Initiative and associated engagement opportunities. How to do a SWOT (strengths, weaknesses, opportunities, threats) analysis and environmental scan – what’s working and where are the opportunities for improvement? Ambassadors will be encouraged to identify a “sponsor/partner/mentor” who will be a point-of-contact for them and work collaboratively with them. Ambassadors will develop goals, timeline, outcomes, etc. and use this individual as a source of accountability, in addition to NCCS support. Note: Ambassadors were selected for the 2019 pilot program. We hope to offer the opportunity again in 2020. 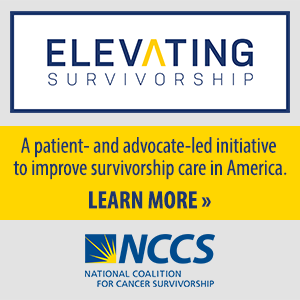 If you are not already a member of our Cancer Policy and Advocacy Team (CPAT), complete this questionnaire to sign up for free and you’ll be notified by email about future Elevating Survivorship advocacy opportunities. A patient advocate, age 18 or older, who has been touched by cancer. A member of the NCCS Cancer Policy and Advocacy Team (CPAT). Not a member? Click here to sign up for free. Committed to working at the local level to improve survivorship care. Monthly learning collaborative calls/webinars with educational topics. 1:1 mentoring/support by NCCS team. Report progress on project plan goals and action items. * Travel and lodging for Ambassadors will be paid for by NCCS. Ambassadors should have lay or general knowledge of survivorship care. They should also have the skills to develop and maintain relationships with individuals in order to host presentations and trainings to cancer care teams. Ambassadors will be selected to ensure representation from a variety of CPAT stakeholders. 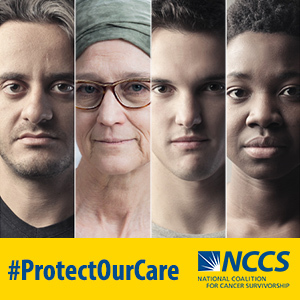 NCCS attempts to represent a diversity of stakeholder perspectives on projects and committees, including type of cancer, geographical representation, gender, race/ethnicity, and other factors. This is a self-nomination process. To be considered for selection as an Elevate Ambassador, please review and submit the application, including questions about your expertise and interest, a resume or CV, a short bio, and a letter of reference. To save your progress and complete your submission later, please click the “Save Progress and Continue Later” link at the bottom of this page, next to the “Submit” button. A secure link, valid for up to 30 days, will be generated. Note: When using the ‘Save and continue’ feature, uploaded documents will NOT be saved when continuing the form from the secure link. You must re-upload the documents prior to final submission. DEADLINE EXTENDED: Applications must be submitted by February 11, 2019 at 11:59 PM ET. The deadline for Elevate Ambassador applications has passed. If you have any questions or believe you have received this message in error, please contact Kelsey Nepote at knepote@canceradvocacy.org.